These valuable mechanical instruments usually suffer from careless positioning, incorrect display and over enthusiastic handling. Clocks, scientific instruments like barometers, musical boxes and automata are likely to be harmed if subjected to direct sunlight, extremes of temperature or damp. A common, but probably the worst place to place a clock is on a mantelpiece over a working open fire. Dust can clog the sliding or moving parts of scientific instruments and delicate mechanisms… so keep them in a box or in display cabinet when not in use. Careless or unexpected movement can affect the workings of delicate mechanisms too. All long case clocks and wall hung instruments, should be screwed to the wall or to a solid wooden wall bracket or mount. Before moving a mechanical object check that there are no detachable parts; don’t rely on handles but hold the object under the base with both hands. Secure the pendulum of a spring clock by the clip provided or by the spring clamp on many English bracket and mantle clocks. Otherwise remove the pendulum and use folded or scrunched paper to wedge the ticking crutch piece firm. On a long case or other weight driven clock remove the weights and pendulum and take down the clock by separating the case hood and movement. If a mechanism is set in motion while being moved, let it run down completely. Taking Care when moving antique barometers. Mercury barometers should be moved with special care and kept upright in transit; if the mercury moves suddenly its weight could shatter the glass tube. Stick barometers have a little key square at the base; turn this until the column of mercury reaches the top of the tube. Wheel (banjo) barometers must be corked by a specialist before being moved. A photographers soft bristle brush with built in puffer is ideal for dusting lenses and delicate or intricate surfaces. Less fragile surfaces can be wiped with a soft lint free cloth. Avoid metal polishes which may seep into the movement or destroy a valuable patina, like the patina on a brass carriage clock. For stubborn marks on a glass face use cotton wool damped in a mild detergent solution or methylated spirits. Rinse with damp cotton wool and buff gently with a chamois leather. Major cleaning of parts especially if dismantling is involved should be left to a clock specialist. Even oiling the mechanism of a valuable clock can be risky if you don’t know where to apply it, and too much or too thick an oil can attract abrasive grime which can affect the mechanism. With long case clocks if you go away longer than the next due winding, stop the clock to avoid damage to the escapement when it winds down. Make sure you always use the correct key for the clock and make sure it is not warped, rusty, worn or split. To adjust the minute hand of a clock gently turn the hands clockwise (never anti-clockwise) with your fingertips. If the hands jam, move the minute hand back a fraction but never back past the hour. If this doesn’t free them then leave the job to a clockmaker. Antique clock repairs and restoration. If the mechanism stops, forcing it to go may aggravate the damage; repairs should be left to a clock specialist. Even if they are in good working order, clocks and watches with delicate mechanisms should be checked and serviced every three years and those with larger stronger mechanisms every ten years. Have you wound up your mantle clock and started the pendulum? Mantle clocks have either a swinging pendulum or a balance wheel to regulate time keeping. If you don’t see a pendulum attached to the back of your movement, then your clock is regulated by a balance wheel. The pendulum/balance wheel is driven by a powerful spring. Be sure you have wound up the pendulum spring. Wind it up all the way. It is a myth that you can damage a clock by overwinding. If your clock has more than one spring, and your not sure which arbor operates the pendulum, then wind them all. Next, reach into the lock and gently swing the pendulum to one side with your hand. Your clock should now be running. If your clock has a balance wheel, all you need do is wind up your clock, and the wheel should automatically start ticking. Expert Tip: Touching hands are guaranteed to stop your clock! Look at the hour and minute hands closely. If they are touching, the movement is jammed and the pendulum won’t swing. Try moving the hour hand slightly back and forth while pushing it towards the dial in order to clear the minute hand (but make sure it doesn’t touch the dial!). If they still touch, you can bend back the minute hand slightly towards you, allowing clearance. Have you moved your mantle clock? The reason a mantle clock with a pendulum stops swinging after being moved is because the clock case now leans at a slightly different angle than at its former location. Expert Tip: Mantle clock movements are adjusted so that their pendulums swing properly when the clock case is placed on a level surface. However, clock cases warp, or adjustments may change. So put away your level and simply start your pendulum swinging, then listen carefully to the tick-toc sound. Lift the left side of the clock slightly. Does the tick-toc sound seem more balanced? If not lift the right side. When you hear an even balanced ticking simply shim the bottom of the clock at that angle Your mantle should now be in perfect beat. If your clock has a balance wheel instead of a pendulum. You’re in luck, you don’t have to worry whether the clock is level at all. The nut located on the bottom of the bob is used to adjust your grandfather clocks time keeping ability. If the bob is raised up, your grandfather clock will run faster, if lowered, your grandfather clock will run slower. You can remember this principle, with the phrase ‘A SHORT DOGS TAIL WAGS FASTER’. Expect an accuracy of at least 1 minute, fast or slow per week. Start by setting your grandfather clocks time to an accurate electric or quartz clock or watch. Check the time 24 hours later. If the clock runs fast, turn the nut to the left (as you face the clock) and the bob will be lowered slowing the clock. If the clock runs slow, turn the nut to the right, which will push the bob up, speeding up the clock. Then reset your grandfather clock to the correct time again. Keep a written record of the distance you turn the nut each day and the resulting minutes off. Do this every day until you have zeroed in within 1 minute of the correct time. Then, switch to checking your grandfather clock every 7 days, using the same process until your grandfather clock keeps time within 1 minute per week. Expert Tip: Many grandfather clocks are designed so that one full turn of the pendulum nut equals 1 minute per day. So, for example, if your grandfather clock is 2 minutes fast in a 24 hour period, turn the pendulum nut 2 full turns to the left. Keep in mind that this rule of thumb is not true with all grandfather clocks. And remember, mechanical clocks are not as accurate as modern day electric or quartz clocks! When you regulate the pendulum of your grandfather clock, you are attempting to achieve the best time-keeping possible from a mechanical clock between weekly windings. During your weekly grandfather clock weight windings, its a good idea to make it a practice to also reset the minute hand to the exact time of day as established by a quartz clock in the house. Does your grandfather clock have two nuts attached to the pendulum rod? Some grandfather clocks have not one but two nuts on the bottom of the pendulum rod. If your grandfather clock has two nuts then you probably have a really accurate grandfather clock. Many owners believe that the bottom nut is used as a lock nut against the the top nut. But this isn’t so. Expert Tip: Make sure the bottom nut doesn’t touch the top nut. Let the top nut raise or lower the pendulum bob until the most accurate timekeeping has been obtained. Then by turning left or right, use the weight of this nut as the final delicate time adjustment to regulate your grandfather clock. Remember, you not only have to pay the clock dealer a good deal of money when you purchase a nice clock, you must spend more money maintaining it. 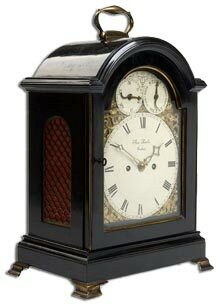 You are now responsible for the care and welfare of your gorgeous and expensive antique clock. Take care of it properly, if you don’t you’ll be much poorer. Within 3 years or so, the oil lubricating the moving parts in your clock will start to dry up. The wheel arbor pivots will start grinding into the brass plates of your clock, knocking out alignment of the wheels that drive the various clock functions, and resulting in a loss of power, and ultimately… stoppage. Your antique clock doesn’t flash a red warning light when its running out of oil, but just like your car, it can continue to operate while serious damage results. You must oil your clock every 3 years. In addition, you must have the clock professionally cleaned every 6 years. Do it, and you will avoid unnecessary damage. What should you do if your antique clock has not been oiled in over 4 years? Stop it … Further running will just cause more damage. 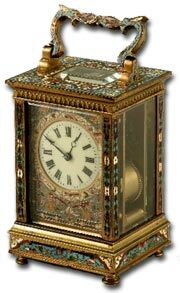 Call a professional repairer or restorer and have the clock completely dismantled and repaired.